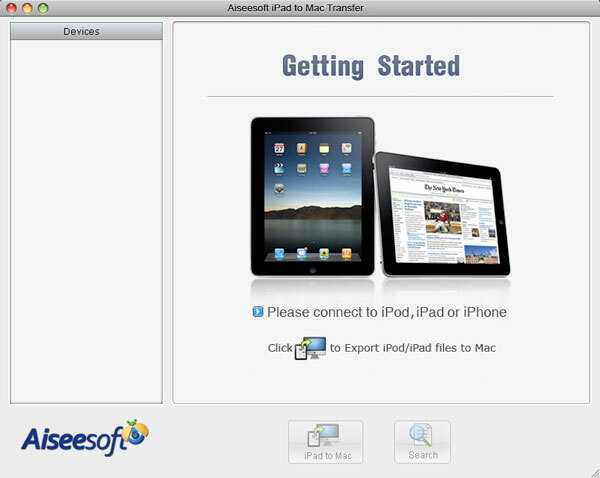 Aiseesoft iPad to Mac Transfer acts as a versatile iPad to Mac transfer. Not only to transfer files from your Mac to iPad like iTunes, Aiseesoft iPad to Mac Transfer can also copy your selected video, audio and image files to your Mac immediately without any loss, as well as copy files from iPad to iTunes library. Just connect your iPad to Mac, choose the files your want to backup and click one button. All the process will finish instantly. Aiseesoft iPad to Mac Transfer can successfully transfer iPad videos and music to your Mac. The Mac iPad transfer also transfers music, movies and videos from iPad to iTunes on your Mac. The Aiseesoft iPad to Mac Transfer software not only supports iPad, but also works for almost all Apple players including iPad, iPhone 4, iOS 4.2, iPod, iPod Shuffle, iPod Nano6, iPod touch 4, iPhone 3G, iPhone 3GS and so on. The "Search" function can help you to search your files in the categories of Genre, Artist, and Album for you to find your file as soon as possible. Aiseesoft iPad to Mac Transfer supports all iPad/iPhone/iPod models and transfers iPad files with high speed. iPhone, iPhone 3G, iPhone 3GS.